I was absolutely thrilled to find out that I placed in 2 of the 3 categories for the Canadian Stampin' UP! Annual Achievement Awards! I earned the #2 spot for Leadership (# of Senior Associate Promotions in First Level) and the #4 spot for Recruiting. This is a huge achievement and I totally credit all the awesome demonstrators in the "Canadians, INK!" group for helping me earn this -- THEY ARE THE BEST DARN STAMPIN' WOMEN a gal could ever have on her team!!! But the best news was the announcement that, for the first year ever, the Canadian AAA recipients are also being invited to the Founder's Circle retreat in September. I'll be spending my birthday (!!!) in beautiful southern Utah staying at a lovely inn nestled by Zion National Park... stamping, relaxing and rejuvenating with some of my peers. I am SO excited! 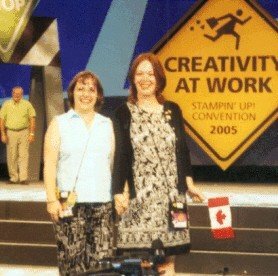 My girlfriend Josée from Ottawa (seen here with me when we walked the stage at Convention last year) is also going along too, so we're all full of excitement & busy sharing ideas of what we'll do when we go! It was a bit of a disappointment that I couldn't make it to Convention myself this year, since it would have been just insane to go up on the stage to accept my award, flowers & a big hug from Shelli herself... but she'll just have to give me a big birthday hug instead!!! WOOHOOO!!!!! My upline is going too! She wonderful, you'll love her. Her name is Christy Harsch from Alberta. Congratulations Caroline! That's great news. How cool that the Founders' Retreat takes place over your birthday!